Sporting achievements were celebrated last night (10 May) with West Oxfordshire District Council and its leisure provider GLL presenting awards to the District’s top sportspeople. 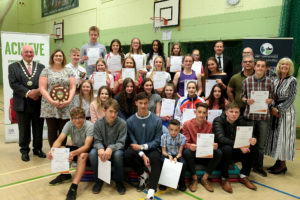 f the Year and their Head Coach, Chantal Clavaud, taking the Coach of the Year honour at ceremony held at the Windrush Leisure Centre in Witney. 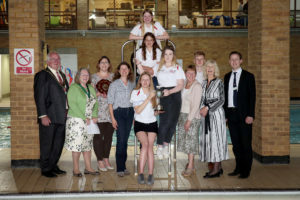 The Club has 170 swimmers aged between six and 18, with 13 competing at a regional level and six in national competitions. The Unsung Hero award went to Mick Widdows, a groundsman at Chipping Norton & District Cricket Club. He was nominated for maintaining an excellent cricket field standard for the teams to play on, as well as carrying out maintenance work at the club all year round and in all weathers. He even opens the the bar on Fridays. Callum Smart is on the England Talent programme and hoping to be selected to swim for GB at the 2018 European Juniors in Helsinki; he would like to compete at more world championships and ultimately the Olympics. Jamie Coleshill, regional director at GLL, said: “It is vitally important to recognise talented athletes. For many this will be the first award they have received and for us it is fantastic to be able to invest in the local community.